Looking out the window of the Ruby Mercantile, 2007. Photo by Kathy Weiser-Alexander. Today, Ruby remains private, owned by a couple of different families who are working to preserve the town and make it into a recreational area. The good news is, they now allow visitors. The old settlement continues to boast more than two dozen buildings. 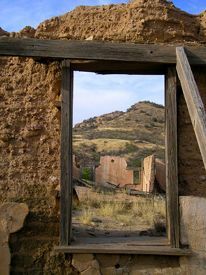 Only Vulture City rivals it in the number of remaining structures in a ghost town mining camp. Some of the more interesting structures remaining today include the school, which continues to display its chalkboards and some furnishings; the jail, mine offices, warehouse, head frame, the infirmary, and several homes. Two small lakes created by the dam remain shining blue against the mountains and surrounded by shifting sands created from the many tailings of the area. It’s a beach oasis in the middle of the desert. Across the sand dunes is an old cemetery. The hill behind the warehouse is unsafe for hiking, as it is filled with collapsing mining shafts below the ground. During the mining heyday, the main shaft extended down some 700 feet with lateral bores heading out some 2,000 feet at various depths. Over the years, water erosion has added to the instability and large cave-ins have occurred across the mountainside. At the time of our visit in 2007, work continues on the town of Ruby to stabilize its remaining buildings that will continue far into the future. A perimeter fence that has been erected around the site has resulted in a noticeable improvement in the water quality of Ruby’s two small lakes, as cattle are prevented from entering the site. Though the lake has never been stocked, it does provide some fishing opportunities, as visitors have pulled out bluegill, catfish and large mouth bass. A Colony of Mexican free tail bats, numbering an estimated 1.5 million, makes their home in Ruby’s abandoned mine shafts from May to September. During the summer, it is a sight to see as the emerge enmasse at sundown from the mine. Looked after by an on-site caretaker, the site can be accessed, as of this writing (2007), only Thursday through Sunday. After driving through the main gate, stop at the caretaker’s house. There, an admission is charged ($12.00 per person as of this writing,) a short oral history given, and a map of the old settlement provided. Fishing and camping are also allowed, also requiring a fee. Ruby, Arizona is located about 30 miles west of Nogales and four miles north of the Mexican border. To get there from Nogales, take I-19 north to Ruby Road/AZ-289 West, exit 12. Follow 289 for some 10 miles before arriving at the town site. Much of road is unpaved, winding, and can be treacherous. A high clearance vehicle is recommended. 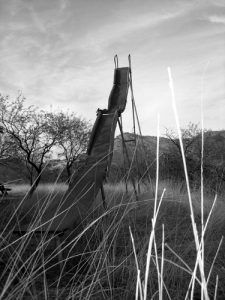 An old slide stands behind the Ruby school. Photo by Kathy Weiser-Alexander, 2007. Click for prints & products. With it’s bloody history, it would come as no surprise if this old ghost town is haunted. But, search as I might, I could find no stories or tales of any spiritual goings-on there. Well, …. there is one old legend that tells of the mercantile having been built over an old padre’s grave. After the first double murder, while a police officer was investigating, he was told by an old time local that there was a curse on the building. Explaining further, the old-timer said: “Old Tio Pedro died years ago. He predicted evil for the occupants of the post office ‘cause it was built over an old padre’s grave.” The investigator confirmed the superstition with the local peace officer, who informed the investigator that, yes; the legend was common among the Mexicans of the area. Perhaps, there was something to the superstition, as murder and mayhem were not yet over at the Ruby Mercantile. The store was sold and the next occupants of the building were also killed a year and a half later. While, I don’t consider myself a ghost hunter, it seems, that I frequently “run into” them, whether it’s a story or tale I read or hear about, or, on a rare occasion, a “glimpse” of one. In any event, we had roamed the Ruby buildings for about an hour and as we made our way back out, we stopped at the old Ruby school along the way. A fascinating building that still holds its historic chalk boards, as well as some furnishings, I was immediately hit “in the chest’ with a feeling of a presence. When I do “glimpse” a ghost, this is usually the way it first portrays itself – with an extremely heavy feeling in the chest. I walk into the next classroom where Dave is snapping photos, when we hear footsteps in the other room. But, when we quickly return, there is no one there. Suddenly, the footstep sounds begin again in the the room we just left. Again, no one there. 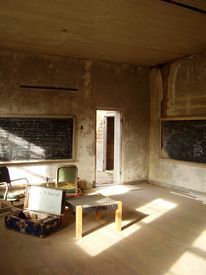 Inside the old Ruby Schoolhouse. Click for prints & products. Because, my focus is not the ghosts, but rather, the ghost town, I would ordinarily let this drop. However, the feeling is so intense I insist on going back and talking to the caretaker. Have they heard of a ghost in the school house? Dave argues, “they’re going to think you’re crazy.” Oh, well. I forge forward. No stories of ghosts in the school house. In fact, the only thing that has been heard, is a story of a long dead old miner that has made himself known. But, I am sure that something unnatural was in that schoolhouse, which happens just happens to be close to the old Ruby Mercantile. The presence; however, didn’t feel “malevolent,” just there. In any case, it was interesting and I’m now wondering if anyone else has any tales of Ruby ghosts? Let us know in the comments below. Visited Ruby 02/24/2018, family ties and interest’s. Building next to jail wasn’t a house. Grocery/Post Office. Four murders occurred there by bandits, the owners. Two murders and the next year two more. Ruby, a piece of American History to discover and explore. Very educational! No Ghosts, Wolves! Yes, Mountain Lion’s are all over Arizona! Enjoyable peaceful place, if you’re interested in visiting a town from the past. History at it’s Best!